The University of New Mexico-Gallup hosted its first fall commencement on Saturday, Dec. 13 at the Hiroshi Miyamura High School gymnasium. 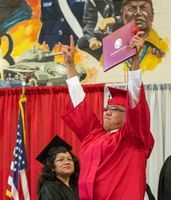 Over 100 students attending classes at UNM-Gallup completed their requirements for graduation by the end of the fall semester, and 57 of those graduates and their families attended the commencement exercises. With over 1,300 audience members in attendance, graduates processed into the gymnasium as the Miyamura High School Band performed “Pomp and Circumstance.” The Gallup High School ROTC presented the colors and the National Anthem was performed by UNM-Gallup student Ian McLaughlin. Welcome and opening remarks were given by Jeannie Baca, director of Student Affairs, Edwin Begay, president of the UNM-G Local Advisory Board and Christopher Dyer, executive director. Eric Etsitty celebrates after receiving his Associate of Applied Science degree in the Administrative Assistant program. Bachelor and graduate degrees were conferred by Monica Orozco Obando, vice provost for Extended Learning who attended the ceremony from the UNM main campus. Associate Degrees were conferred by Dyer. UNM-Gallup has traditionally held one commencement exercise each year at the end of the spring semester. In an effort to honor the achievements of fall graduates who may not return for spring graduation, and to make the ceremony smaller and more personal, UNM-Gallup administrators decided to pilot a fall commencement. Congratulations to the fall 2014 graduates of UNM-Gallup.